How to Edit Left Sidebar Menu in MediaWiki? I recently deployed MediaWiki for one of my project to help my team members share and collaborate on specific research areas. By default, MediaWiki comes with a left sidebar that features navigation links such as Main page, Tools, Special pages, Recent changes, Upload file etc…If you ever want to change the menu items or add your own menu section in left sidebar of MediaWiki, then here’s how you can do that. 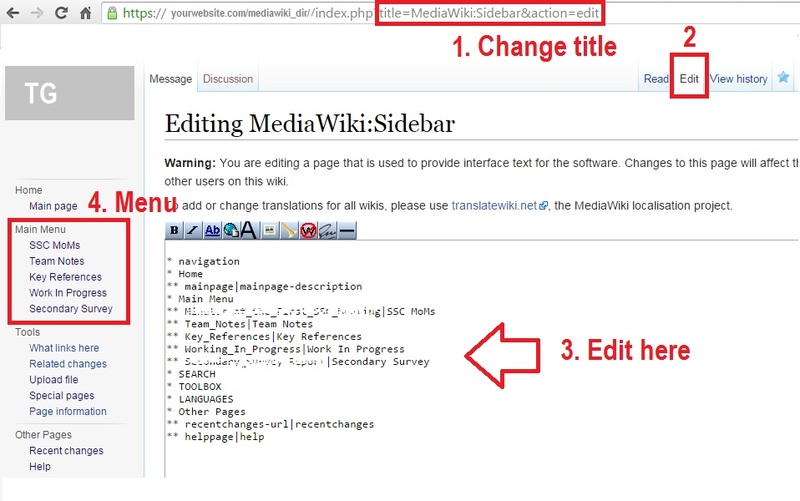 First of all, you need to navigate to ‘MediaWiki:Sidebar‘ – by editing the address bar. For example, the http://sitename.com/index.php?title=MediaWiki:Sidebar. Once done, you will be taken to Sidebar page – click ‘Edit‘. Now, you can add menu heading with single asterisk and menu items with double asterisks as shown below.